The B-Meg Llamados overcame a sluggish start and clamped down on defense to rout Barangay Ginebra, 82-67, to take a 1-0 lead in their PBA Commissioner's Cup best-of-five semifinal series last night. Held to only eight points in the first period and down by 15 early in the second, the Llamados got their act together and returned the favor, holding the Kings to eight second-quarter points to grab a 33-29 lead at the half. 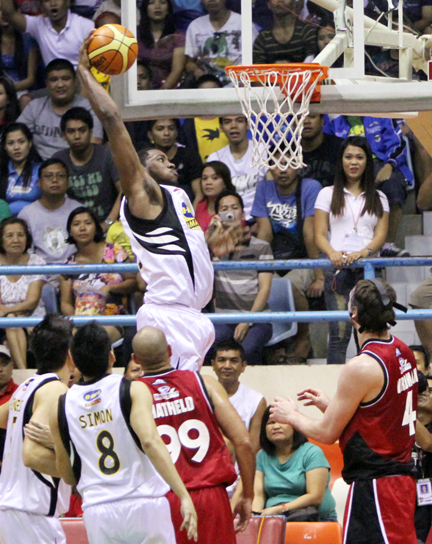 "We didn't get off to a good start," said B-Meg coach Tim Cone. "They had a nice game plan, pick and rolling, and we were turnover-prone early. But we started playing better defense." B-Meg continued to roll in the third period with James Yap hitting back-to-back jumpers and Josh Urbiztondo burying two triples as part of a 15-2 run that pushed the Llamados ahead, 50-33. The Kings made a bit of a run, cutting the lead to 12 at 52-40, but B-Meg closed the period with an 8-2 run as Ginebra lapsed into numerous unforced turnovers. At the end of the third, the Kings had managed to score only 42 points, meaning they had scored only a combined 21 points in the second and third periods, matching their entire first-quarter output. "We got going in the second half," Cone noted. "We built a lead, it was a surprising lead. It just kind of occurred. Having to play a physical game against Meralco prepared us for this one." Things were so bad for Ginebra in the third that they were turning the ball over even without any pressure from B-Meg. Dylan Ababou had a clear breakaway layup in the open court, but he lost the ball just as he was about to lay it in. Minutes later, Rudy Hatfield caught a good pass underneath, but fumbled the ball out of bounds. Then still a bit later, John Wilson drove along the baseline and kicked out the ball to no one, Jay-jay Helterbrand being a good seven or eight feet away. The situation only got worse at the start of the fourth and B-Meg already up by 20 at 62-42, when Jackson Vroman, who best typified Ginebra's disappearing act by scoring seven points in the first period but only three for the rest of the game, lost his cool and shoved Yancy De Ocampo in the face. The B-Meg center did his best Mick Pennisi imitation and fell backwards, and his ploy worked as the Ginebra import was called for a flagrant foul penalty 1. The game was essentially over after that, with B-Meg erecting leads of as high as 25 points. Only a mini-run by the Kings near the end made the final score a little more respectable. The Kings were clearly missing Mark Caguioa, who is likely out for the entire series. No one on the team stepped up when things were going south, and Ginebra could have used Caguioa's ability to create his own offense when nothing else was working. He's also Ginebra's emotional leader, and emotion, outside of Vroman's misplaced anger, was missing from the Kings last night. "Caguioa was a factor without a doubt," Cone said. "Mark is their natural x-factor every game. He opens up things for everybody else." The Kings made only 35% of their shots. It was the second straight game that one of the two teams that made the semifinals outright played poorly following a long layoff. Tuesday night, defending champion Talk 'N Text shot only 33% in a 77-84 loss to Barako Bull. But like Barako Bull coach Junel Baculi, Cone is expecting a totally different situation in Game 2. "The second game is really the key. Either youu fall into a hole or go with a lead. We know the character of Ginebra. We know how good they are."